raise your hand if you have ever had a hard time finding a hair stylist that you love. I can’t imagine how many of you are having a hard time trying to find a replacement to your stylist that doesn’t cut anymore due to a new baby or because you moved to another city. it happens all the time. 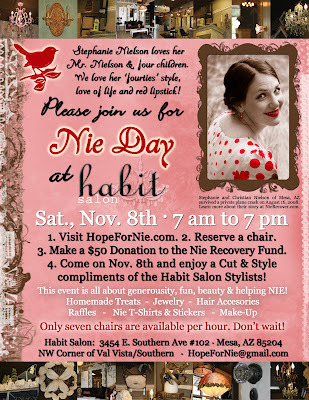 well, check this out – now you can get your mane washed, cut and styled at habit salon in mesa, az for a mere $50 which will go to the nie recovery fund! whoa, I know, it’s awesome. feel free to check out this flyer, this website or http://www.hopefornie.com/. p.s. I'll be blogging about the trip to maryland/virginia soon, so check back for the awesome deets regarding the run, money raised, beautiful fall weather, balloon launch, etc. etc. it was so great. p.p.p.s. it's also our 2 year anniversary today so I'll blog about our celebration tonight (david planned something?) woot! nie is so lovely looking, and yes -- very twilight-esque. lovely, lovely. I was so excited to do this on the 8th but the website says the 22nd. Are they doing both days or just one? whoa, good questions mindyelias. I'll have to check into that. hmmmm. That is so great! I have been wanting to put something like this together at my salon but it has been a challenge to figure a day and time everybody could help out because we are a rental salon! That is great that they are doing that for Stephanie and Christian! P.S. HAPPY ANNIVERSARY!!!! Can't wait to hear what you guys did to celebrate! Happy 2nd Anniversary! Glad you had a nice trip to the East coast. You have been a busy girl! Can't wait to hear about everything! My sister is a stylist at Habit hair salon. Alisa Bird. She is master hair designer at the least! I called her and she said this: It used to be on the 8th. But NOW it's on the 22nd. She wasn't at the meeting today so she couldn't tell me why... just that it had been changed. So, GO on the 22nd!